Charles Willson Peale, a frequent visitor to the Continental Army's Valley Forge encampment, admired Von Steuben's skill and persevering industry [which] effected during the continuance of the troops at Valleyforge a most important improvement in all ranks of the army. In late 1779 or early 1780, Von Steuben commissioned Peale to paint his portrait. Peale, noting that the portrait is now highly approved of, or I am most egregiously flattered, retained the painting while Von Steuben fulfilled his Virginia command assignment. During this time, Peale copied the portrait for the museum. It appears on the museum's list of paintings in the October 13, 1784 issue of the Freeman's Journal and Philadelphia Daily Advertiser. Peale frequently copied his museum portraits for his subjects, generally keeping the life portrait for himself. As Von Steuben had commissioned his own portrait, Peale kept the copy as the museum portrait. The life portrait (now at the Pennsylvania Academy of Fine Arts) shows Von Steuben's epaulettes without command stars. The museum portrait, made after Von Steuben received his command appointment in mid-1780, shows epaulettes with two stars each. This change and the exact rendering of the Von Steuben's medals, illustrate Peale's attention to and familiarity with the details of military decoration. The portrait includes the gold medal (Cross of Fidelity of Baden) suspended from gold ribbon around the neck and the Star of Fidelity of Baden pinned to the left side of the chest. on Steuben was born in Magdeburg, Germany. He attended Jesuit schools in Breslau, entered the Prussian army's officer corps, and served in the Seven Years War. He then joined Frederick the Great's military staff. Later, he was appointed chamberlain to the Prussian court of Hohenzollern Hechingen. In 1777, Von Steuben went to Paris to meet America's foreign commissioners, Benjamin Franklin and Silas Deane, and offer them his military services. The Continental Congress, much impressed by Von Steuben's title and his refusal to accept any salary while in service, immediately sent him to George Washington at Valley Forge. lthough he spoke no English, Von Steuben systematically trained the amateur American troops in military discipline and battle-readiness. This rigorous training saved the troops from complete defeat during the Battle of Monmouth. In 1779, Von Steuben prepared his Regulations for the Order and Discipline of the Troops of the United States, which remained America's official military manual for over three decades. 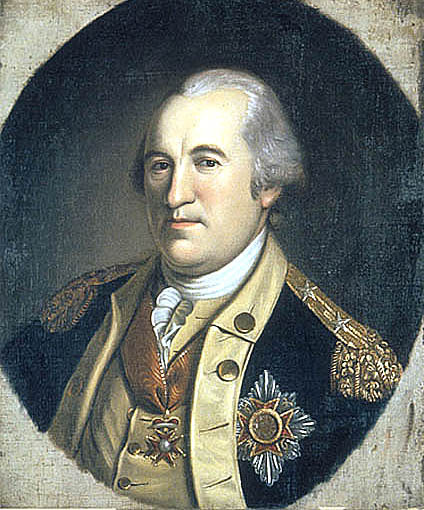 ater in the war, Von Steuben commanded the Army supply center in Virginia and fought at Yorktown. Afterward, Washington employed him in a variety of duties from the creation of a plan to demobilize the wartime army to the acceptance of Britain's surrendered Canadian forts. Von Steuben helped to found the Society of the Cincinnati, and then resigned his American commission in 1784. After the war, the New York legislature granted Von Steuben an estate. He received a small pension from the United States government, but relied on friends like Alexander Hamilton to settle his mounting debts. Von Steuben died on November 28, 1794.